To look at Bill Stewart’s dark and intricately ornamented terracotta sculptures, now on view at Indigo Gallery, is to confront the familiar and the mysterious, the solemn and the comical. Though he has exhibited widely, Stewart is probably best known in Western New York for his elaborate, large-scale, anthropomorphic figures, finished predominantly in gunmetal black. They smack of whimsy and magic, tricked out with layers of evocative symbolism, ambiguous allusions, and idiosyncratic baubles. Four such figures are included in the intriguingly titled Trickster (another one is on display in the exceptional Art in Craft Media exhibition at the Burchfield-Penney Art Center), along with numerous smaller, wall-mounted works. The large standing figures, which form the centerpiece of the show, are approximately five to six feet tall, including their ceramic bases. They are mounted on these foundations by metal rods like stick puppets, allowing the feet to dangle freely as if the figures are mystically hovering just above the ground. With their eclectic mix of high and low cultural appropriation, they ignite a visceral spark of recognition when you initially view them. This first blush quickly fizzles, however, when you try to decipher the source of the familiarity. Stewart calls these works shamanistic. In cultures around the globe, shamans provide a magical link to the spirit world through the use of elaborate attire, masks, spells, and accoutrements. With their myriad of archaeological, cultural, and mythological juxtapositions, Stewart’s figures do evoke a genuine, if slightly off-kilter, spiritual presence. But it’s a presence derived from an invented world, comprised of savory morsels of the artist’s myriad interests fed through the Cuisinart of his imagination. The Navigator, for instance, hovers above a base in the shape of a boat, which holds a domesticated pig and wild boar in its bow. Both animals bring into play a wealth of symbolic connotations; the boar playing a particularly rich role in Celtic iconography. The figure is wearing a comically tall pointed sorcerer’s hat. (Or is it witch’s hat?) Appropriate for a shaman, but similar headgear has played a variety of roles as social signifiers throughout history. The red polka-dot tip adds a note of absurdity, along with three doughnut-shaped loops that circle the crown like a child’s toy or ring-toss game. From the brim of the hat, long strands of black rope suggestive of dreadlocks hang down, partly obscuring a slightly bewildered, mask-like face. The clothing is reminiscent of Asian military garb via Sergeant Pepper. One hand is held up in the abhaya mudra, a Buddha gesture conveying a sense of peace. These mix-and-match allusions and playful irreverence place the figure outside known space and time. Fitting for a shaman. The other large works are similarly adorned with numerous embellishments, such things as dangling human figurines, insect forms, funky platform shoes, layered necklace strands, tusks, beaks, and cherry-shaped beads. Most of these details are painted or otherwise treated to match the distinctive glaze, with occasional splashes of color or black flock added for good measure. Shaman mysticism aside, Stewart’s artistic roots are planted in West Coast Funk art, and the irreverent humor and jovial goofiness of that movement are notably present in these works. 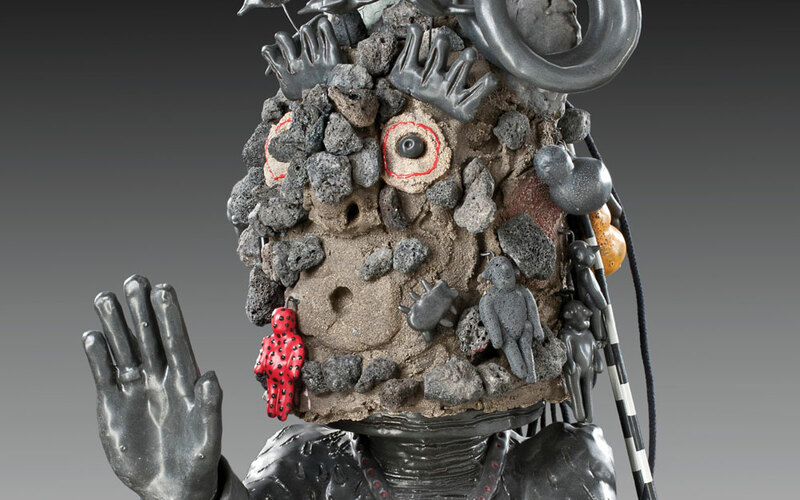 The figure titled Shaman, for instance, looks a little like Big Bird’s eccentric aunt, back from a visit to Africa, wearing a hodgepodge of souvenir attire and toting a baby goat. The hand positions on all the standing figures are similar, but here, coupled with a slight turn of the head, it reads more like a demure, preening gesture. The smaller, cruder, sand-crusted wall pieces owe their appearance to folk, naïve, and primitive art, and maybe even more so to outsider art. Many seem like children’s drawings come to life. Viewed in association with the larger shamanistic figures, they can be read as fetishes—objects believed to exert power over others. Central African minkisi or West African and Haitian voodoo “dolls” are two such examples. They dangle dumbly on the wall, sans feet or hands; their coarse cartoon faces wear blank expressions. Some have little circular mouths that seem to be miming “Ooooh.” Two are only heads, with Matt Groening style rabbit ears and long, spaghetti-like pendulums hanging from their mouths. Others sport derby hats or crowns; one is covered in small bird forms, with a beak peeking from its mouth. In all his work Stewart grants himself unfettered freedom to play with form, texture, and pattern, generating richly tactile surfaces. Finally there is the question of the show’s title. Selected by Indigo gallerist Elisabeth Samuels with Stewart’s blessing, Trickster injects another set of ideas into the mix. Many Native American traditions view tricksters as necessary bridges to the sacred world. Laughter, it was believed, liberates people from rigid thinking. A title can do the same. The trickster is an ever evolving folkloric archetype appearing throughout history around the world. Sometimes a shape-shifter, sometimes an anthropomorphic character, at times just a Machiavellian mortal, tricksters are agents of chaos bouncing in legend between villain and hero. Tricksters break rules, defy conventional behavior, and bend social mores, playfully disrupting the norm. They often invert danger, prevailing through resourcefulness and deception, challenging and ultimately mocking authority in the process. A contemporary version is Br’er Rabbit, whose antecedents go back to African storytelling traditions. It’s tempting to view Stewart’s figures, especially the larger, standing ones, as tricksters of a sort. They might represent Hermes-like characters serving as guides to some make-believe underworld. 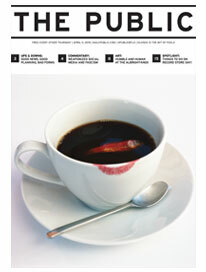 They certainly break a number of art world rules, invert artistic expectations, defy ceramic conventions. They might also be viewed as benevolent and wise fools whose purposeful absurdity teaches an important lesson about free thinking and inventiveness. Ultimately, though, the figures are not the trickster here. That title must go to Stewart himself.